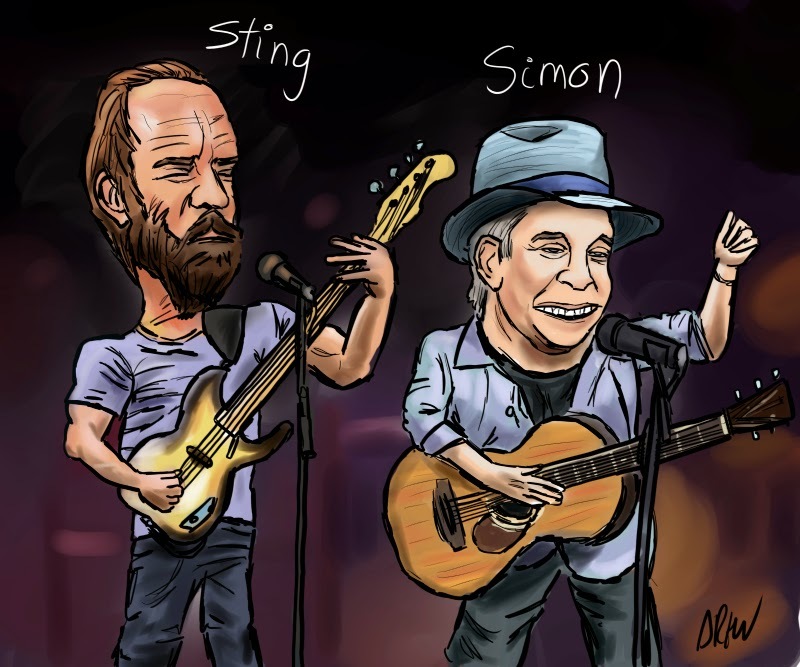 The Sting and Paul Simon tour arrived at the SSE Hydro on April 10th and the gig was excellent. Not only was Paul Simon a genius and perform flawlessly, Sting added something to the duets and got the arena rocking to some of his Police anthems including Roxanne, So Lonely and Message in a Bottle. Simon and the amazing joint band proved they could boogie as well to numbers like Me and Julio and Call Me Al. Yet my favourite moments were perhaps some of the more thoughtful numbers like The Boxer, Shape of my Heart and The Cool, Cool River. If you can still catch the tour before it ends in Amsterdam you won't be disappointed. I drew the caricatures the night before based on reports of Sting's new hipster look. On the night Simon wore his trademark hat but ditched the purple shirt and put in a pretty impressive stint for a legend in his seventies. The only other concert related cartoon I've done is this one about manufactured pop.